Special note: Reservations for a Sponsored Kiddush are not automatic and depend on availability. If you wish to hold a Kiddush and to date have not made reservations, please contact Tina Greenberg at 973.994-2290, ext. 217 to make arrangements. Q: If we are leaving immediately after services for our reception offsite, am I responsible for providing a Kiddush for the congregation? A: No, you are not required to host a sponsored Kiddush. Q: If I am having a Kiddush, but prefer to hold a private Kiddush, what is the difference between this and a sponsored Kiddush? A: With a sponsored Kiddush, the congregants who are attending morning Shabbat services are invited to join you, your family and guests (we suggest you prepare for between 15-20 members). The housekeeping fee of $250 and the food standard* applies. For a private luncheon, the congregation is not invited and the applicable facility fee is charged. Q: Can we co-host a sponsored Kiddush with the family with whom we are sharing the date? What if there is a duplication of requests for a reception? A: Yes, many TBA families have chosen to share their simcha and co-host the sponsored Kiddush with the other family. We encourage families to discuss their plans with each other before finalizing any requests. If there is a conflict, both parties will be notified and given the opportunity to resolve the matter. 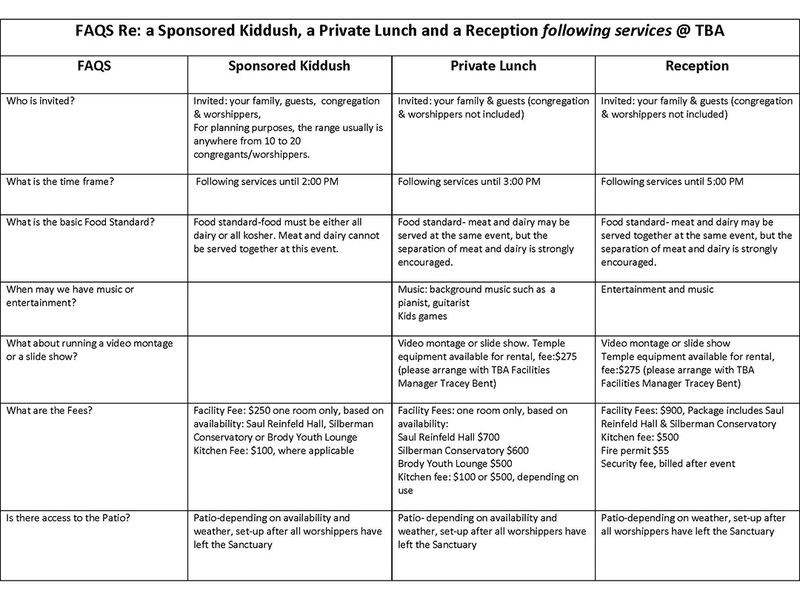 Q: What are the time frames for a sponsored Kiddush, luncheon and evening receptions? A: Shabbat Services end approximately 12 noon–12:20 PM. A sponsored Kiddush begins following services, as does a luncheon reception. Luncheon and evening receptions are scheduled for five hours. An evening reception may begin anytime after 7:00 PM. Q: Are photography and videography permitted during Shabbat Services at TBA? During the service pictures may only be taken from the choir loft. Flash, artificial lights or any special lighting and/or strobe attachments may not be used during the service. Please use mufflers on the still cameras. No more than four persons other than the choir and organist are permitted in the choir loft. Therefore, if there are two families who wish a visual record of the service, each family is allowed a maximum of two persons in the loft. During any photo session, under no circumstances may you unroll the Torah scrolls. This also includes your personnel or any Bar/Bat family members. Q: When can we take “posed” family photos in the Ross Sanctuary? A: To arrange to take photos on the Friday prior to your child’s simcha, please call Tina Greenberg at 973.994.2290 ext 217 to schedule an appointment for that Friday.